As we welcomed Spring (in the Northern Hemisphere, while the Southern welcomed Fall), the Aries Sun and a Libra Supermoon on Wednesday we faced massive astrology. 2019 is proving to be loaded with potent and unique opportunities for transformation and major karmic shedding. This Libra Full Moon was the first of two, and in April we will meet the second part of this relationship journey. I imagine you felt this transition into Spring in a big way, and perhaps with some unexpected events as well? Remember, Uranus is in Taurus and and this Full Moon had a good amount of Venusian energy (Venus rules both Libra and Taurus) so sudden changes and unexpected events were highlighted. Chiron in Aries, the Wounded Rainbow Healer in the archetype of I Am was conjunct the Sun, opposing the Full Moon. This brought light to generational wounds, marking where the healing needs to occur. As we move through the healing it is important to stay attentive to the new stories we are weaving. This week I found myself in the midst of an unexpected narrative that led to great healing. In turn, I honored the Full Moon with many tears and offerings, including this mandala I anchored on my land. When in doubt, go to the Earth and offer your Truth. Earth offers us comfort, a sense of belonging and solutions. In fact, in this life there are problems that only the Earth may solve. Earth has the ability to rearrange the cells of our bodies for great healing and brilliant solutions. I believe with Uranus in Taurus we have the ability to receive creative, genius keys like never before. The Earth Mother wishes for you to be you. This will be my third year stewarding a pilgrimage offering those who identify as womxn to fall in love with the Earth. Earth, Water and Mineral are the essential elements that will be guiding our work together in the Avalonian pilgrimage Women at the Well. All elements come from the Earth. As we connect to Earth we will anchor our nine days together in Glastonbury and Cornwall. The holy waters will trigger a process of awakening and rebirth for each one of us. A splash of recognition will stir our cellular memories, cleansing and purifying. In this year of the mineral, we will take the time to step deeper into our stories, to rewrite our narratives as we travel through time and space with the ancient stone beings of Stonehenge and Avebury. If this pilgrimage calls to you, I invite you to email me and we can set up a time to connect on the phone. If you feel a Call, listen to that. Your mind will most likely list numbers of reasons why you cannot do this. However, part of our curriculum at this time is to listen to the Calls we hear, and to follow our gut intuition as we uplevel our paradigms. Resistance is often a sign that true healing and change is about to occur. Last week I wrote about how there is no arrival point. Resistance is a part of the terrain of transformation. As we become comfortable with the discomfort, we drop the old patterns with ease and grace. On this Venus day, I send you and yours Infinite blessings. About ten days ago when I posted about one of my Kundalini Yoga classes on instagram, I wrote, this is a practice, there is no arrival point. The astrology of 2019 is asking each one of us to radically devote to self through a daily practice. It is essential in these times. What I am noticing is that no matter how long we are on our journey of cosmic, conscious evolution we are still susceptible to the forces of adversity. To maintain a steady state of frequency is necessary in these times. In fact, it is downright revolutionary. There are multiple frequencies vying to divert and distract you. It is an endless practice to avoid negativity. I believe that this is only possible with a daily commitment to self. In all honesty, a daily practice is far from glamorous. It is challenging and often can feel like an uphill climb with very little at the top as a reward. However the gift lies in the ability to show up for yourself each and every day, no matter what. Especially when you don't feel like it. Especially when it's like moving through the sludge of your shadowy swamp. We are being asked to drop all distractions, to create deeper connections as we continue on the paths of transformation. This means deep karmic clearing and a commitment to consistently checking in with our shadow while we evolve and grow. It will be necessary for each one of us to face our inner and outer Truths, to move fluidly between the conversation of the 3d reality and our spiritual aspirations. As we do so, we will create a real sense of belonging. Community will be essential for creative solutions to living on Earth are necessary for our continued expansion. Keys to thriving in 2019 are managing energy with a daily practice that can anchor you into the here and now. Create and maintain crystal clear intentions. . .again, this is why a daily practice is essential. Stay grounded and rooted, create time in nature and water to ground. Claim your inner voice and wisdom. . .only you know your soul’s truth. Walk your talk, be impeccable with your word. And finally focus on what you wish to create versus what needs repair. Each year I steward a pilgrimage to a sacred site in honor of womxn seeking a deeper connection to Self, their ancestral lineage and to the Earth. When we step away from the day to day rhythm, carving out time connect to the elements, while doing so amongst sacred and wild spaces, we heal in ways that are beyond our imagination. We invite in a deeper sense of self knowledge, we activate our creativity and we heal our immune systems. This August, we will return to Glastonbury, also known as Avalon for an 11 day pilgrimage that will culminate at St. Nectan’s Glen in Cornwall, a special fairie glen where we will sleep for three nights. These sacred lands are certain to stir an awakening deep within your soul. This pilgrimage has a special water element that will offer an authentic rebirthing. You may scroll down or visit this link to discover more. I would love to welcome you through the Gates. Stay tuned, as I am in the midst of a powerful five day training and am receiving fresh insights into Women at the Well, and the specific medicine that is wishing to come forth for our time together. It is going to align exactly with what 2019 is asking all of us! We live in phenomenal times. To me, time is best measured by the sacred spiral. The spiral is a natural form of sacred geometry that appears at all levels of nature. From the micro to the macro, from the cellular to the cosmic. Spirals are the natural product of Phi (Ф), the 'Golden Section' or the 'Golden Mean'. This week we welcomed Uranus in Taurus, the Great Awakener in the archetype of the Lover for the first time in 84 years. And just hours after this epic shift, the Moon renewed herself in Pisces at 16°. Just about 18 hours prior to this lunation, Mercury went retrograde at the degree of karmic completion of Pisces, which is the culmination of the entire zodiacal wheel. This is the Omega point, broadcasting an intuitive journey of emotional insights with the possibility of great spiritual awakening. Mercury will retrograde back to 16° Pisces, the exact degree of Tuesday’s New Moon in Pisces, signifying the importance of the month of March. We are in a portal of time and space to rebirth, redo, renovate and restructure our lives before we welcome another spiral of zodiacal wheel as the Sun and Moon rebirth with Aries. Awakening is not easy and it is not comfortable. It is awkward, it is about feeling the emotions we have hidden from ourselves, it is raw. This month there is a collective opportunity to have an experience of choosing to awaken or to check out. Neptune, the High Heart, the force of agape and great spiritual love is dancing with Mercury retrograde over the next few weeks. Activating the Ancestors and the dreamtime is favored this month. In Dreamcircles Ancestral Healing we connect in this way, honoring our dreams while honoring our ancestral lineages. Today while offering an astrological reading this transmission came through, ‘Security is an inner state, not an outer one.’ As we celebrate International Womxn’s Day, I feel the more each human being creates an inner state of security, a ripple effect of healing we will transpire on our Earth. Part of the medicine of Uranus's movement into Taurus is to dissolve all of the structures that are no longer working for our planet. This August, we will return to Glastonbury, also known as Avalon for an 11 day pilgrimage that will culminate at St. Nectan’s Glen in Cornwall, a special fairie glen where we will sleep for three nights. These sacred lands are certain to stir an awakening deep within your soul. This pilgrimage has a special water element that will offer a deep soul level of rebirthing. You may scroll down or visit this link to discover more. I would love to welcome you through the Gates. March offers a great energetic shift as Uranus moves into Taurus on the morning of Wednesday the 6th at 3:29 am EST. Uranus is the higher octave of Mercury, our communicative conduit through electricity to Spirit. Uranus serves as the Great Awakener affecting the collective in a massive way. Radical insights and solutions are transmitted from Uranus, including unpredictable shocks that may be jolting to the nervous system. However, Uranus always offers solutions for our greatest good, although in the moment it may not always feel like that. Just about 13 hours before Uranus's movement into Taurus, Mercury retrogrades in Pisces at the degree of karmic completion, offering clues to the past, emotional and intuitive insights. Mercury in Pisces has a hard time finding the words and would much rather express through creativity, the arts and movement. We will most likely feel as if we are swimming in the deep, dreamy ocean of life. We will all have the ability to review, revise, rewrite and renovate as we shed outdated paradigms in our psyches and behaviors. Communication is a major theme in March. As Uranus is transmitting from afar, Mercury's retrograde in Pisces is asking us to go deep within. There is a beauty in this energetic that is encouraging a pure stillness to listen to the spaces between the words. With Uranus in Taurus we are birthing a new era from now through 2026. We can expect genius solutions to blossom in regards to our ecology and natural resources, collaborative community engagement and realized personalized medicine to occur. The reality is that you are your own healer and that we are the medicine. This translates into each one of us taking personal responsibility for our well being. It is essential in these times to ground each and every day to Mother Earth. May you find ways to give gratitude to this beautiful planet that holds you. Perhaps consider welcoming a daily practice that includes giving offerings to the Ancestors, embodiment practices, time in Nature, deep sleep and lots of good clean water. If you're seeking guidance on how to strengthen your nervous system and glandular system check out the Cosmic Collective on my patreon page for support. We are circling up this Tuesday in my temple living room from 5:30-8:30 pm in honor of the Pisces New Moon Womnx's Wisdom in West Asheville. I will offer greater insights on the month to come, stone medicine tonics, kundalini meditation and gong soundhealing. Honestly though, the most beautiful element of these gatherings is the sweet and soulful community that comes together in sovereign, sacred space. Finding ways to stay grounded and nervous system strengthening are everything. May you find beauty in the ocean of transformation. As we approach the Virgo Full Supermoon which is exact Tuesday, February 19th at 10:53 am EST I wish to share with you an archetype of Virgo that is rarely spoken of, the Great Celestial Healer. Virgo often gets written off as neurotic, analytical, pessimistic and nitpicking. However an elevated way of seeing Virgo is in her sovereign purity and the why behind that which she strives for. Virgo sees e v e r y t h i n g. Yogi Bhajan said to Virgos, you see everything and everyone naked, just don't tell them. Next Tuesday on the Supermoon the Great Celestial Healer will align with the Shaman of the Zodiac, Chiron, who will have just anchored into Aries. These two interstellar healers are offering us potent medicine. Chiron in Aries will bring a Return for those born in 1968-1977. Chiron Return is the final of the four midlife activation transits that intend to purify each and every human so that they may live within their heart and authenticity. With Chiron in Aries we are moving into uncharted territory. Chiron in Aries wishes for you to pioneer your wildest dreams into reality, to express your gifts with courage, to allow instincts and intuition to guide your way forward, to truly live authentically with the body as the Holy Temple. Chiron will offer each one of us a rebirth of identity, a soul retrieval. The earthy Supermoon in Virgo will allow each one of us to witness all of the places within and without that need realigning. Where can we clear space in our lives to allow more magic to pour forth? This Full Moon is conjunct Regulus, the Heart of the Lion in the Leo constellation, amplifying our courage, ambition and royal selves. With the Milk Moon Mercury and Neptune pair up with a flowing energy to Venus conjunct Saturn. These four planets will create an alignment of spirituality, compassion, healing, and deep insights into the mystical realms. Therefore this Full moon is a beneficial time to tap into the dream realm, work with divination and ceremony. Even though we will be in the shadow of Mercury retrograde, you may also use this Full moon to get projects off the ground, especially if you planted seeds for them around the New Moon. We are on a steady build to the deeply healing Full Milk Moon lunation which will occur February 19th. On that day Chiron will shift into Aries ushering in a whole new generation of healing around our identity as humanity. The Aquarius New Moon gifted us with some special frequencies of growth that are still available to harness. So yes, you still have an ability to cast your magic. As we are building towards the Full Moon we are in a portal of possibilities. Perhaps you have witnessed that the astrology of 2019 is just as immense of 2018. I know today you are feeling it with Mars conjunct Uranus at the 29 degree of karmic completion. The Sabian symbol for this is 'The music of the spheres.' What is being requested with this energetic is an attunement to the cosmic order and a deep listening of your inner voice. Creative insights are available and at the same time major shadow is coming up to be cleared as we complete this 8 year cycle. Earlier this week a meme crossed my path saying, 'It's up to us to break generational curses. When they say "it runs in the family" you tell them "and this is where it runs out".' You are here to be a paradigm shifter, a lineage transformer, a code breaker. What we are experiencing on the collective and personal levels right now is an activation that happens once in 502 years. So the question is, What are you going to do with this opportunity? In the past week I have held space for many going through deep transformation in their lineages. I myself am going through radical changes that are at times overwhelming and downright complex. Yet two wise friends both left me with a sacred message that I wish to pass on to you. Trust the process. And how may you trust the process? Build your altars. Give offerings to your ancestors. Make sacred fires. Honor and serve your community. Give thanks for the abundance of gifts that are before you. Venusian Day blessings. As many of you know Venus rules my chart and I love to use these days as a time to honor this force of culture and beauty that is often seen as a sister to Earth. What I am finding is that the language of the cosmos is essential for these times. Tantrika is found to come from the roots of the word tan, meaning to weave and tra meaning to liberate. Each one of us is liberating Self through the weaving of our cosmic evolution. In the depths of tantra, we find the Truth that the microcosm reflects the macrocosm. ‘The Emerald Tablet’ written by Hermes is a cornerstone of Western astrology that teaches as above, so below, as within, so without. One could imagine the multiverse as just one body, the Goddess governed by the unmanifested consciousness God. 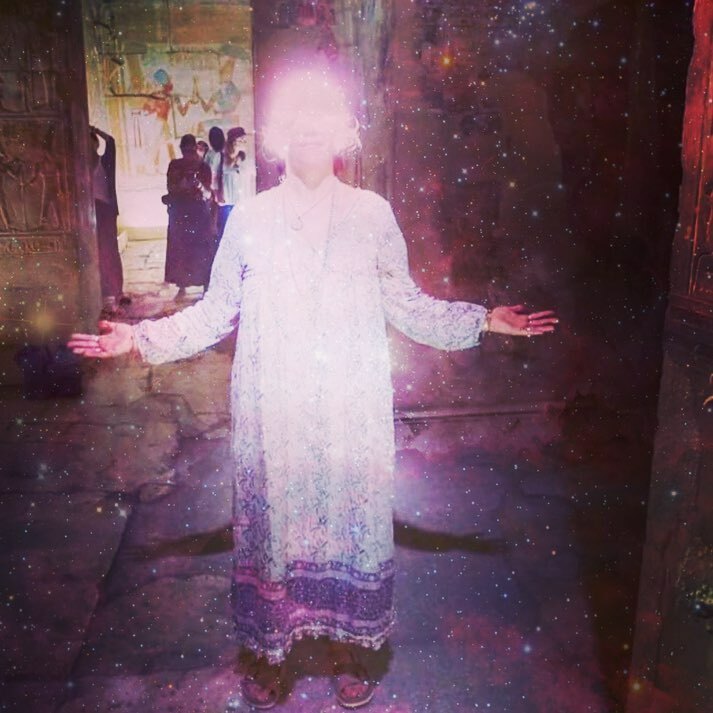 I personally love how Yogi Bhajan breaks down G O D as generator, organizer, destroyer. Both astrology and tantra seek to expand consciousness and liberate energy through rhythm. The moon is our guardian of rhythm while we are on Earth. We are building steadily to the Super Blood Full Wolf Moon Eclipse at Leo 0°51’ which will be exact on January 21 at 12:16 am EST. The eclipse will be visible from Europe, Africa, North and South America. This moon is very close to our Earth and may bring high tides, solar flares, unpredictable actions and behaviors. This is an essential time to stay grounded and hydrated. You may find grounding by placing your feet on the Earth and taking baths and showers. Kundalini technology recommends always being near a body of water during an Eclipse. In this Full Lunation Pluto, Mercury, the Karmic South Node and Sun all square Uranus which allows us to cut the cords of the past. It is time for each one of us to leave behind all the spaces and places where we have settled, played nice, or have not been true to Self. The question to ask is, Where have you underestimated Self? This is a holy time to stand up for your authenticity. We are clearing family karma, healing lineages, and completing cycles, particularly one we can trace back to February 2017 when we experienced the first Full Moon Lunar Eclipse in Leo in over 18 years. As we dissolve the past we have the ability to radically create our futures. Now it is time to birth a new mission, to write a new story. On January 21 the Sun enters Aquarius, ushering the archetype of the cosmic visionary from the future. In the Northern hemisphere we find ourselves deep in the midst of winter, incubating the seeds of the Capricorn New Moon while mentoring closely with Uranus and Saturn. Aquarians are humanitarian and deeply concerned with the earth community. As a whole, 2019 is a time to honor our connection to the Earth for the next 7 generations to come. We can all do better in stewarding this beautiful planet we call home. In support of your journey through 2019 I invite you to join me on patreon. As you become a patron of my art, we have an opportunity to mutually support one another on this great cosmic journey. If you sign up now, you won't be billed until February 1st, so you will receive all content for the month of January complimentary. Which means if you find it is not a good fit, you may unsubscribe before you are billed. We have an ancestral healing circle and an astrology salon coming up live in the next week or so and I am really looking forward to creating a space of depth for our time together. I have crafted these offerings as a Call to what I hear many of you asking for. More support. A deeper understanding of astrology, ancestral healing and how to commit to a daily practice. A community, a tribe. And accountability to your self mastery. In this year of the Empress we are asked to live our creative genius. The Karmic South Node in Capricorn is contracting to get to the core of our wounds while the Dharmic North Node in Cancer is engaging us that to feel is to heal. As the Empress blends spirit and matter, we are the embodiment of self mastery, the pearl in the oyster. As we build to this Super Blood Full Leo Wolf Moon Eclipse Moon Eclipse we are being asked to create closure, to heal, to shed. And with that, we are required to let go. In the collective psyche we have an opportunity to make great strides in clearing our grief, our most ancient ancestral grief. When we resist these natural laws of life is when we suffer. When we flow, we love with our infinite resources and vitality. Be the tantrika of your destiny.